Yamba Rotary’s fundraising over recent months has produced an outstanding result: a $13,745 cheque made out to Burrumbuttock Hay Runners. Funds raised at Rotary’s Tim the Bream and Eat Street Yamba events were augmented by $2,750 raised at a movie night in conjunction with Yamba Cinema and almost $1,000 collected from money tins located in various businesses around the town. “One hundred per cent of donations go directly to support drought affected farmers in New South Wales and Queensland through the Rotary Drought Appeal,” Yamba Rotary’s community projects director Gayle Doe said. “Every dollar counts and Rotary deducts no fees from the donation. 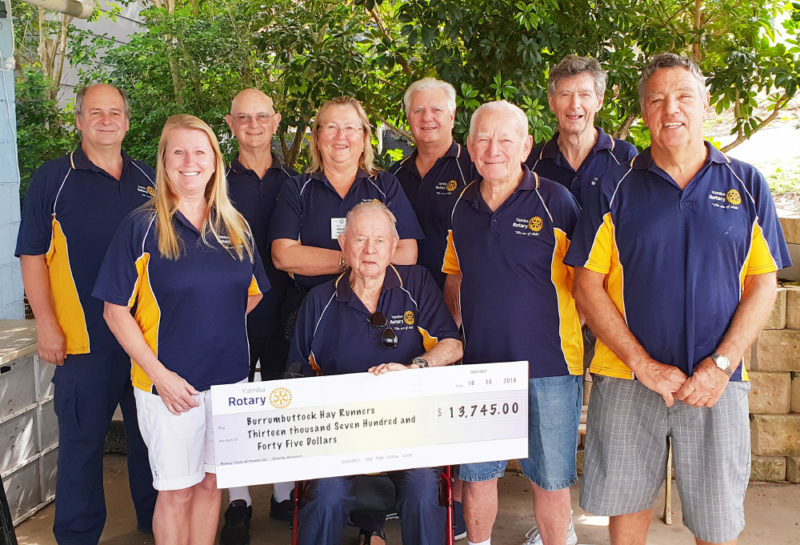 “Our donation to the drought appeal came about as we had been challenged, by the Rotary Club of Currumbin-Coolangatta-Tweed, to match or surpass their donation of $10,000-00 towards the Rotary Australia World Community Service Drought Appeal. The club has also purchased two more defibrillators which will be placed in Yamba Waters Gateway Village and at the Whiting Beach car park. “This brings the total number of defibrillators in Yamba to 16, of which six are now available to the community 24/7 in helping to keep Yamba heart safe,” Ms Doe said. Ms Doe said the Burrumbuttock Hay Runners deliver hay donated by farmers from all over Australia. “No one is paid a wage, they are all volunteers,” she said. “This includes truck drivers who also donate the use of their trucks and machinery to load and unload the hay. Ms Doe thanked all of the businesses and sponsors “who donated their time and goods for free, which helped us to make these events such a success”. Ms Doe thanked NSW Fisheries for supplying the Tim the Bream tags “and the many local businesses who donated prizes to the competitions”. Yamba Rotary meets on the second and fourth Tuesday of the month for dinner at the Yamba Bowling Club at 6.30pm; and on the first Tuesday of the month for breakfast and Yamba Backpackers at 7am. The club welcomes new members; contact Gayle Doe on 0417 002 682 or email yambarotaryevents@gmail.com for further information.